Monopartite, linear, dsDNA genome of 140-240 kb. The genome contains terminal and internal reiterated sequences. Latency: remains latent in PBMCs. ASSOCIATED DISEASES HHV-5: congenital CMV infection. TRANSMISSION Infected body fluids (urine, saliva), transplacentary, transplantation, blood transfusion. Beta-herpesviruses have evolved different strategies to inhibit the host adaptive immune response. For example, HCMV US2 destroys two components of the MHC class II pathway, HLA-DR-alpha and DM-alpha, preventing recognition by CD4+ T cells. Mouse cytomegalovirus (MCMV) uses m152 and m06 encoded proteins to inhibit surface expression of MHC I molecules . Apoptosis is very often modulated (and usually inhibited) by beta-herpesviruses. Human cytomegalovirus (HCMV) viral inhibitor of caspase-8-induced apoptosis (from gene UL36) plays a role in the inhibition of apoptosis by interacting with the pro-domain of pro-caspase-8/CASP8 and thus preventing its activation . Murine cytomegalovirus m38.5 protein interacts with host Bax in infected cells and thus inhibits Bax-mediated cell death . 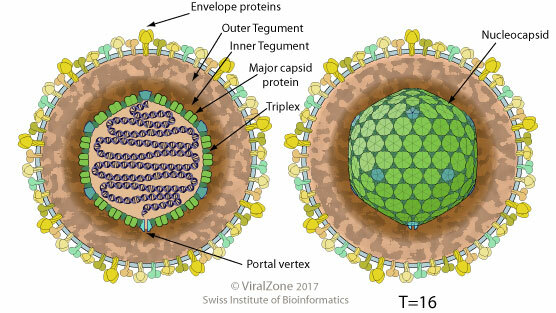 Several beta-herpesviruses are able to inhibit host autophagy process, such as HCMV protein TRS1 via its interaction with host Beclin 1 . Herpes viruses inhibit the cascade leading to production of interferon-beta by mainly targeting the host IRF3 protein. For example, HCMV targets host IRF3 protein with the viral pp65 protein .